Good luck! Car Audio Mono-channel Amplifier. Amplifier Class: D. Max power output: 3000 watts. 4 ohms: 380 watts x 1 channel. 2 ohms: 630 watts x 1 channel. 1 ohms: 800 watts x 1 channel. Gain Adjust: 200mV-8V. Good luck! Car Audio Mono-channel Amplifier. Amplifier Class: AB. Max power output: 1500 watts. 4 ohms: 120 watts x 1 channel. 2 ohms: 200 watts x 1 channel. RCA Input: 2-channel. Gain Adjust: 200mV-8V. 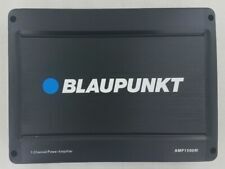 BLAUPUNKT AMP1501. 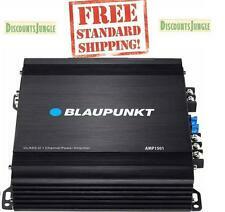 1500 Watts Max Power 1-Channel / Monoblock Class D Car Stereo Amplifier. Amplifier Install Kit. Amplifier Class: D. Non Car Audio Products. Marine Audio. of channel: Mono Block (1). 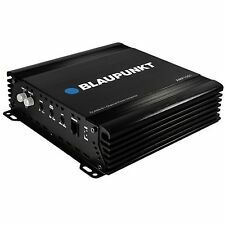 Amplify your car radio's electrical signal for a better coverage with Blaupunkt EMA 1300 that is solely German-made and high quality in function. output power : 1200W x 1. MPN : EMA 1300. Model : EMA 1300. 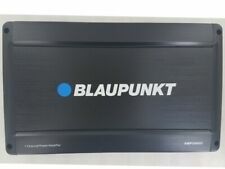 New in the box Blaupunkt Velocity series VA1400 Mono subwoofer amplifier. Refer to pictures for specs. MPN : EMA1300. Model : EMA1300. 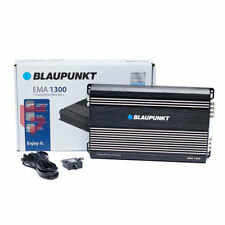 Amplify your car radio's electrical signal for a better coverage with Blaupunkt EMA 1300 that is solely German-made and high quality in function. output power : 1200W x 1. No of channel:::Mono Block (1). (( FREE 8G. Crossover Slope (dB/oct): 12dB/oct. Crossover Frenquency: 40Hz - 180KHz. Fuse: 20A x 2. RCA Input: 2 Channel. Total Harmonic Distortion: <=0.05%. ). Model: AMP1501. Car Audio 1-channel Monoblock Full Range Amplifier. RCA Input: 2 Channel. 4 ohms: 563 watts x 1 channel. 2 ohms: 1125 watts x 1 channel. Max power output: 1500 watts. Gain Adjust: 100mV-6V. Model: AMP1501. Car Audio 1-channel Mono block Full Range Amplifier. RCA Input: 2 Channel. 4 ohms: 563 watts x 1 channel. Max power output: 1500 watts. 2 ohms: 1125 watts x 1 channel. Car Amplifiers. Car Speakers. Built with a newly developed and sophisticated circuit board layout, this GTA DSP amplifier redefines world class. The integrated 25/56 bit DSP gives you the possibility to individualize the sound in your car. Compactly built so this amplifier can fit perfectly into any trunk, which lets you easily connect it to your stereo system. 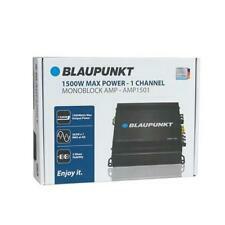 Get amped up for the Blaupunkt 1-Channel, MonoblockAmplifier (AMP1501) and take your car to the next level.